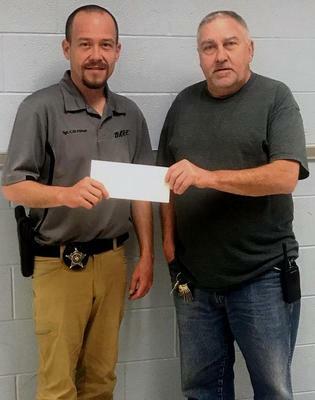 The Town of Clifton Forge has made a donation to sponsor the 23rd annual Alleghany Highlands Bike Rodeo that takes place on May 4th. Activities begin at 10 am at the Jackson River Sports Complex in Covington. Here, Sgt. Chris Fisher of the Alleghany County Sheriff's Office accepts a check from Clifton Forge Mayor Jeff Irvine.